Landlords in Brisbane’s inner-suburbs often get the wrong advice to this question. January and February are busy in the rental market so that must be the best time to have the lease expire. The best time to find a new tenant if the property’s becoming vacant. Right?? property management Brisbane We’ve written before on this “March quarter myth” but we’ve taken a fresh look at the Residential Tenancies Authority bond data. This shows us the median rent for all new bonds lodged during each quarter, and we went back 10 years. Across inner-Brisbane rents actually dropped 1.8% on average during the first quarter of each year. During April to June they rose an average of 5%. The first quarter is by far the busiest, with one third of new tenancies starting. But the downside for landlords is really clear – there’s a lot of tenants looking at this time of year, but in most suburbs there’s also a lot of competition for your property. Inner Brisbane property manager are busy and we’d argue many of them get too busy. In some cases they might not respond quickly to enquiry, are too slow to process applications from tenants and generally can’t give your vacant property and your customers – the tenants – the attention needed. Old heads in the property management profession plan for this time and we add resources to stay ahead of demand. Brisbane’s inner-city rental market has its nuances so you need a tactic that works for your neighbourhood and your type of property. Across the wider Brisbane marketplace the March quarter is actually the strongest for rent growth (where rents rose an average 2.6% while June was flat!) If your investment’s in St Lucia and heavily impacted by university demand, then the start of their year is best for landlords. But plan that timing carefully – rents rose an average 5.2% during their March quarters, but dropped 4.1% in the last quarter of the year. Our tip? Look ahead and discuss with your agent the best time of year to rent your property. If it’s becoming vacant soon then why not offer a 14 or 15 month lease? Tip it into that June quarter and improve your outcome next year. The inner-Brisbane rental market is tough for landlords at the moment, particularly for apartments, so it’s worth considering this to ensure you achieve the best possible rent with the least vacancy. 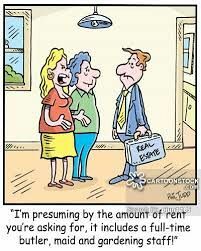 Our inner Brisbane property managers would love to help you!